Sunday 15 April saw Capsel and over 750 riders take on the Tour de Gwent charity cycle ride in aid of St David’s Hospice Care. 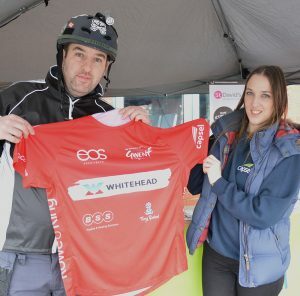 Capsel were one of the main sponsors of the annual event, which saw cyclists take part in one of six routes ranging from three to ninety three miles. Ben Hennessy and Shane Kavanagh took part in the event on behalf of Capsel, both successfully completing the 20 mile ‘Midi Route’ despite the wet weather conditions. Starting off from and finishing at Caerleon Comprehensive School , the route would see them ride out to Usk Cricket Pavilion over some tricky terrain whilst enjoying the scenic Monmouthshire views. As well as featuring on the sleeve of the rider’s jersey, Capsel were on hand hosting a stand at the finishing event talking to riders and spectators about Capsel services and signing people up to find out more. The Capsel fidget spinners were a hit amongst some of the younger spectators. 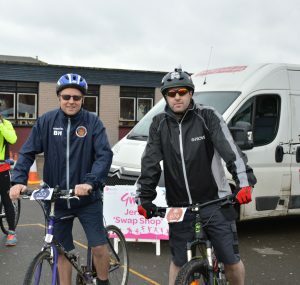 Undeterred by the bad weather, the event had a record number of riders helping to raise £50,00 to help support St Davids Hospice Care and fund hospice services across the region. “Shane was also riding on the day, and as a fellow mountain bike rider, it meant we’d be able to cycle together at a similar pace and enjoy the fantastic midi route that follows the route of the majestic river Usk. “The midi route was a decent challenge, and with the weather taking a significant turn for the worse half way through the ride the pizza and free beer at the end of the ride felt well deserved!